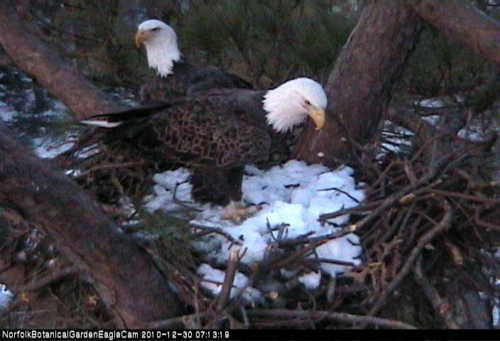 It seems Norfolk is determined to remove eagles’ nests at the Norfolk Botanical Garden. But they really need to slow down and figure out whether this is the best course of action. I live very close to the garden and I’ve come to enjoy the variety of wildlife that such proximity provides. Nearly every night, I see raccoons, possum and foxes. (Earlier this year, there was a mother and three baby foxes who played in my yard.) I’ve also seen a variety of waterfowl and birds. (I will never forget the day I saw a brown pelican dive into Lake Whitehurst, on which my property borders.) I imagine this is what living in the country is like, except I’m within city limits. My premise has always been that these animals were here before I got here, so I need to know how to co-exist with them. The same is true for the eagles. The airport needs to figure out how to co-exist with them. Besides, removing the nests won’t solve the problem. The eagles will come back and make new nests. Norfolk has plans to remove those nests as well. But there are other concerns, as this letter writer points out. For what it’s worth, despite living so close to the garden, I’ve never seen the eagles, except on the eagle cam. On the other hand, I’ve had 40 or 50 Canada geese in my backyard at times. Seems to me they are a greater threat to the aircraft. Norfolk should not make a hasty decision here. And I find their ideas for trying to keep them away abhorrent. Please slow down and think. Using noise and paint guns will not stop these eagles from trying to nest, lay eggs, and raise their young. The City of Norfolk needs to take a step back and think what will help the airport keep the planes and passengers safe. There are lots of deterents out there. The Merlin System, which is used by lots of airports and military airports, which I’ve sent their information to the airport, is a viable solution. I’ve received 2 exact same response “form letters”. It’s not fair that they won’t listen to reason. Harrassing these American icons is NOT the answer. I feel the airport is more interested in expanding their runways and using this to remove the eagles is their best way of doing that. It’s not right!!! These beautiful birds, our freedom’s symbol, is going to be displaced because the airport wants to expand!!! It’s so not right!!! The Airport will not be reasonable since they want to expand and the nests must go. This is all about money. City afraid they will be sued because they own property where eagles live. Airport wants more land. What else is there to say. There will be no reasoning with any of the council or airport people. I do not think that they are going to get these birds out of thier home with the pan that they have devised. Eagles have a very strong sense of territory and will fight for it. I think that after reading up on the radar system that it would be a good solution to the problem and that it should be considered. There is no way the City of Norfolk could be held liable if an eagle caused damage or fatalities because there is no way to prove they came from the gardens. The adults are not banded and the gardens are not the only place where eagles come from. Public safety is of course, of great importance and an issue of which must be taken seriously, and it’s certainly not my intention to undermine the need for that. I do however ask, that given the data and true bird strikes that actually can be traced to that of an eagle, surely there are other options that can be explored, other than the removal of the nest and harassing of the resident eagles of NBG. Birds found dead on or near a runway are automatically listed in the data as a strike, whether it was or not. At least one of the eagles that was included in their data was found dead, and the cause of death was not investigated, it was simply added into the strike data. It’s my hope that once those permits have been authorized that the city will delay the implementation of those permits, to allow further discussion and research, of alternative measures to ensure public safety. One such option is one that many airports and military installations are using; the Merlin System, with a stunning success rate. This video shows how this system tracks the birds… Several airports in this country are using it. This is a very doable alternative, one that is effective and enhances public safety from potential strikes. This system is one that allows the coexistence with the wildlife within urban settings. It is my hope that the airport will explore and implement one that will not result in the loss of the Norfolk Botanical Garden eagles. I have respectfully requested that the City of Norfolk delay the removal of the Bald Eagles’ nests at NBG, by at least one year until further research can be done with research that includes accurate information about these eagles, their nests, their behavior and the actual threat the Norfolk eagles pose to airport safety and research that includes more than just graphic photos and scare tactics that were presented council by the USDA and DGIF. I find the City of Norfolk’s response to the USDA’s “strong advisement to remove the nest” to be irresponsible and abhorrent. I’m afraid the city will have much damage control to do if the current plan of action goes forward. Do the city leaders not understand that the eyes of many eagle supporters world-wide are watching closely? There are many alternatives that should be discussed fully before a rash decision to shoot paintball guns and pyrotechnic methods at our beloved national symbol is acted upon! As pointed out in earlier comments, the city may be able to successfully remove the current resident male eagle and his possible mate, but others will simply come and take over again. Man cannot control everything. Lake Whitehurst is a city reservoir so I don’t imagine they’ll completely drain the lake. I believe the City of Norfolk and Norfolk International Airport have other agendas in mind and this is but a tip of the iceberg. Shame on you, Norfolk! Please, please, PLEASE don’t go through with these removal plans!! Listen to your inner natural child….you know this isn’t the way it was intended to be. There are so many autrocities going on in the world, mostly of Man’s own making. PLEASE don’t add to it by doing this. It is an exercise in futility which will cause nothing but upset and misery to the Natural World.